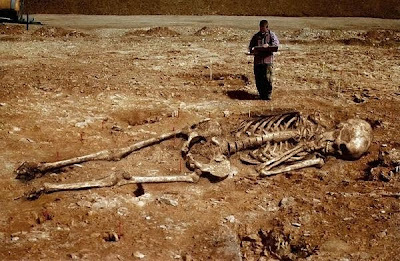 "A team of anthropologists found a mysterious burial in the jungle near the city of Kigali Rwanda (Central Africa). 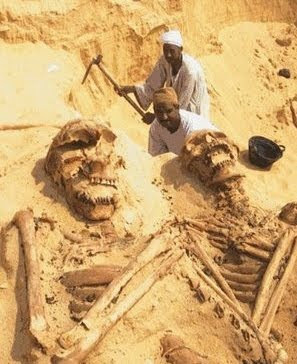 The remains belong to gigantic creatures that bear little resemblance to humans. Head of research group believes that they could be visitors from another planet who died as a result of a catastrophe. The anthropologists believe that the creatures were members of an alien landing, possibly destroyed by some terrestrial virus to which they had no immunity. However, no traces of the landing of the spacecraft or its fragments were discovered." "Blimey," I thought, "How come it's not in the main UK or USA press?" Obviously the article is a hoax, though I did also find the story on the Korean Times website. I say obviously a hoax because there are no photos or proof. The photos in this post refer to another 'find' of giants or aliens I found on The Missing Piece website. Again the pictures are generally thought of as fake. And there are lots and lots of similar stories on the Internet. The Pravda article I mentioned, at the beginning of this post, gives other examples of where 'creatures' have been uncovered. What I'm really getting round to is that hoax, or made up articles muddy the waters for anything that may just possibly be true. We see this especially with UFO sightings. Think of Roswell for example. If we read everything on the subject we may well end up being swung either way as to whether this is fact or fiction. Governments are good at hiding and muddying the waters about things they don't want us to fully know about. We are also fed lies and untruths. Just look at the reasons for going to war with Iraq. There will be a time when a dramatic truth will be made public. We just have to make sure that we don't all scream, "Another fake, it's a hoax!" Let's keep an open mind to all possibilities. One day information will be revealed that seems beyond our present understanding - and the rules and meaning of life will then change forever. Good points, Mike. Back in the 90s, two guys - tricksters, for sure - confessed to faking some crop circles, so suddenly the consensus was that all crop circles are fake. Yet, crop circles still appear, some so complex and intricate that I don't see how they can be fakes. Trish: I remember those guys showing how the crop circles are done with planks of wood and rope but, as you say, this doesn't mean they are all fake. There have been some amazing patterns on English fields.